Pacific Northwest Twist. This is a great spirit for classic gin cocktails as well as some of the newer craft cocktails that have been created over the past couple years. It is also excellent just sipping on the rocks or neat! A complex mix of flavors will be realized, sweet lemon, berry, mint, a slight hint of ginger spice coriander. The traditional juniper is there but it's mild. Dryness at the end cleanses any sweet notes experienced at the start to ensure a clean and crisp finish. The Famous Bicycle Tree of Snohomish was located just on the outside of town near SR 9 and became a landmark for tourists and locals alike. We remembered the second Bicycle Tree that was created but both are long gone. 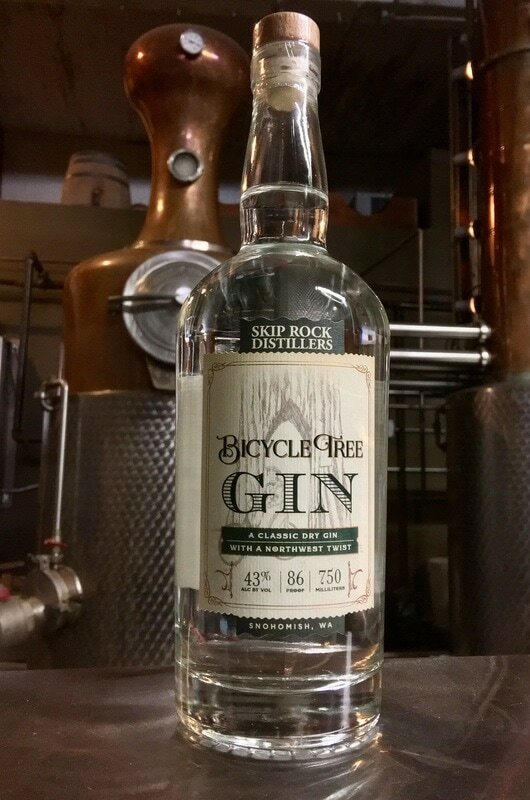 Our Bicycle Tree Gin was named to pay homage to Snohomish history and one of the many unique and great landmarks that have contributed to our beloved town. "Clear color. Fresh, exotic aromas of lemongrass, galangal, fresh red bell pepper, green olive, green apple, fennel, and peppermint-basil with a satiny, dryish full body and a long cracked peppercorn, mustard seed, and fresh juniper shrub finish. A delightfully fresh gin packed with notes of fresh herbs; a springtime delight."